hampagne carries almost mystical properties for a vast number of people. However, there are a bewildering number of Champagne houses, co-operatives and growers bottling wine under their own labels and a further huge own-label business with wines of immensely variable quality all being bottled under the auspices of just one appellation. The great Champagne houses virtually invented the concept of the brand in winemaking and in most cases they do a very acceptable job. Nonetheless, in the absence of a better classification system the area remains a minefield for consumers. At the last count, there were some 33,000 plus ha under vine with many of the 19,000 growers cultivating no more than a hectare or two. Both in the cellars of the region and in the vineyards there are inevitably substantial variations in quality. Things however are changing. Though accounting for only a very small percentage of exports, 30 or so top independent Champagne domaines are make a big impact visually out of all proportion to their size in the smart streets and restaurants of cities worldwide. Window shop down New York’s Fifth Avenue or London’s St James and you are as likely to see a bottle of Selosse or Jacquesson as a flagon of Krug or Cristal. The same holds true for Milan, Melbourne, Singapore and Tokyo. The boutique ethos has had as much qualitative effect on Champagne as in Haute Couture. Making sparkling wine is realistically the only consistent vinegrowing activity that can be undertaken here, among the windswept rolling hills of the most northerly of France’s wine regions. Alsace may be on a not dissimilar latitude but crucially it is protected by the Vosges Mountains. Ripening the three varieties, Pinot Noir, Meunier and Chardonnay is by no means easy. Pinot Noir and Chardonnay are at their optimum in the production of the great wines of the Côte d’Or some 240 km (150 miles) to the south. The vital requirement here is to provide grapes that are physiologically ripe and of sufficient intensity to produce good wine. That means controlling yields and harvesting properly ripened fruit, which remains a problem. By contrast, Champagne has been lucky to have had a run of good to excellent vintages since the millenium -only 2001 was really poor. The risk of unripe fruit (as happened unexpectedly in 2011) is generally now less acute as a result of discernible warming since the late 1980s. But challenges are still very real on the negative side of climate change: the chaotic distribution of summer rainfall, destructive hail storms and devastating spring frosts- the Aube lost at least 80% of production in spring 2016. Within the appellation the communes have been classified as Grand Cru, Premier Cru or Deuxième Cru. This does not however give an indication of quality or the potential of a given terroir as it does in Burgundy but works more as a means by which to establish the price a grower gets for his harvest. You may have an outstanding performer in a second-classed village and a moderate grower in a grand cru. The appellation falls into five main districts, which account for some two-thirds of the working vineyard area. These five districts may yet become their own sub-appellations in a desired move to establish better regional identity within this geographically extensive AC. The rest of the appellation is spread across a vast area. Indeed, the idea that all Champagne comes from fabled chalk soils is not the case. Much of the vignoble is clay and sandstone. In the classic zone of Champagne, the Montagne de Reims is just to the south of that Cathedral city. The north-facing slopes of the Montagne at Verzenay, Verzy and Beaumont sur Veille are home to Pinots of majesty and tension, capable of long life. The aspect of the vineyards affords warmer temperature as the Montagne extends southwards. Pinot Noir and Meunier are the predominant varieties here and are famed for producing rich, full-bodied Champagnes. The village of Bouzy is as well known for producing the best still Côteaux Champenois reds as it is sparkling wines. Other villages nearer the river making excellent Côteaux Champenois Pinot Noir are south-facing Äy and Cumières, particularly in 2015, one of the warmest dry summers for many years. The Vallée de la Marne to the north-west of the Montagne de Reims stretches east along the River Marne. The centre of the district is the town of Épernay and the best vineyard sites are to the east, particulalrly in Äy itself and its neighbour Mareuil -sur- Äy. Red grapes are predominant here and the wines tend to be a touch lighter than those from the Montagne de Reims, with more elegance and refinement. 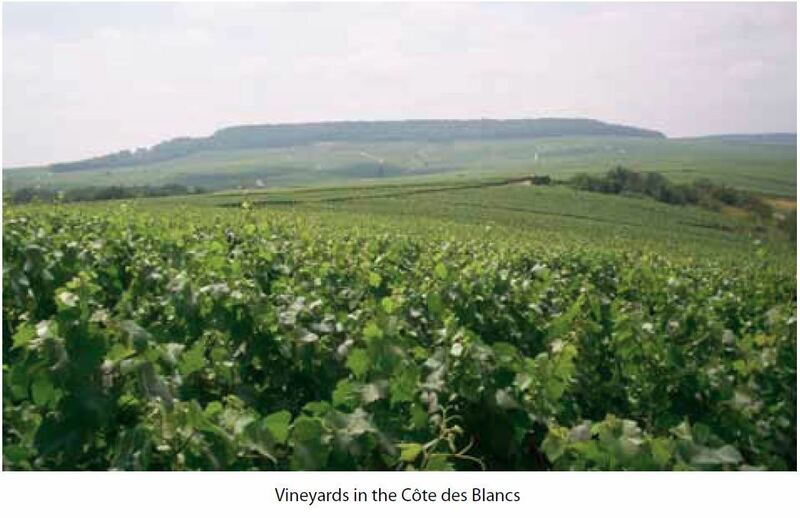 The Côte des Blancs is, as the name suggests, white wine territory. Chardonnay is virtually the exclusive grape here with very few red plantings. The vineyards are largely sited with an easterly aspect. The great Chardonnay villages of Cramant, Avize, Le Mesnil-sur-Oger and Vertus are found here. In the far south west of the main Champagne area, north of Troyes, is the Côte de Sézanne, with the small town of the same name at its heart. The vineyards are dominated by Chardonnay, which accounts for some seven out of every 10 vines. As in the Côte des Blancs there is extensive chalk in the soil but not to the same degree. Way to the south of Troyes and away from the main Champagne appellation boundaries is the Aube. The main vineyards in the district, now known as the Côte des Bar are one hundred miles from Reims. The soil is different, there is little chalk but more of the Kimmeridgian clay and limestone soils of Sancerre and Chablis. The latter is in fact a good deal closer to the Aube than any of the other Champagne vineyards. At present the Aube is largely planted to Pinot Noir. There is a case for a considerable increase in Chardonnay. The area could potentially make extremely rich and powerful Blanc de Blancs. The range of different styles available takes in sparkling white and rosé along with the still red wines which use the Côteaux Champenois appellation. While the role of the master blender in Champagne remains as significant as ever, the development of wines that come from single terroirs or from the same, very specific sources when vintage conditions favour – like the great Salon wines – seems likely to accelerate as time goes on. The sheer quality of many of the emerging small growers is a signal of things to come. The styles and method outlined below should only be used as a very general guide; there can be significant variation within these. It is quite possible to find deluxe super-premium cuvées that are non-vintage (NV), Blanc de Blancs that may be from a single vineyard or a blend of many, or Blanc de Noirs in vintage and NV versions. Most common and providing the bulk of the output of the great Champagne houses are the regular NV blends. The use of reserve wine stocks is an undoubted asset, but a huge variation in quality exists. Available vineyard resources (and consequent fruit quality) and the length of time on lees in bottle are just two of the factors that affect the style of these wines. You should expect Vintage cuvées to be a significant step up. They should be denser and richer with significantly greater structure. Inevitably there will be more variation in style with these as they reflect the nature of the year. Generally they should only be released after good harvests. Blanc de Blancs is produced solely from Chardonnay while Blanc de Noirs is produced from Pinot Noir and/or Meunier, to the complete exclusion of Chardonnay. Blanc de Blancs is more refined and elegant and often has a tighter structure when young, whereas a Blanc de Noirs is fuller, with richer, more opulent flavours. The pink Rosés can be made either by blending in a little red wine (the only AC where this is permitted) or, and generally with better results, by the normal manner of a short maceration on skins. The best rosé generally comes from pure Pinot Noir. The most expensive Champagnes are the Deluxe bottlings or Luxury Cuvées. There is a wide range of styles but the best are among the finest white or rosé wines in the world. One of the most distinctive of these is the great Dom Ruinart vintage Rosé made from 80% Chardonnay with 20% of the best still Pinot Noir.